The Townsville City Waterfront Priority Development Area (PDA) was declared on 5 September 2014. The Townsville City Waterfront PDA Development Scheme was adopted by the State Government on 23 October 2015. This project marked a major milestone in the future planning of Townsville’s CBD with a clear focus on stimulating economic growth in our city heart. Development of the Townsville City Waterfront PDA will be facilitated through a partnership between the Queensland Government, the Port of Townsville Limited and Townsville City Council with planning and development assessment responsibilities shared between the State Government and council. The Townsville City Waterfront PDA Design Guideline and accompanying Inspiration Guideline were adopted by Council on 27 November 2018 and commenced on 11 January 2019. The guidelines were one of the key projects identified in the Townsville City Waterfront PDA Development Scheme. The purpose of the guidelines is to support the delivery of key outcomes within the Townsville City Waterfront PDA Development Scheme for development in Area A (Townsville City Council)1. The objective of the guidelines is to provide additional information and direction for all stakeholders to deliver consistent development outcomes within the PDA. The Townsville City Waterfront PDA Design Guideline and Inspiration Guideline should be read as a whole and in conjunction with the PDA Development Scheme and other relevant PDA guidelines, practice notes and material referenced in these guidelines. View the 3D Flythrough to experience the vision for The Waterfront. Public notification of the Draft Waterfront PDA Development Scheme closed 18 August 2015. During public notification council staff engaged with over 1,500 community members through the Discovery Box in Ogden Street and a number of “Meet the Planner” sessions held across the wider city. More than 270 submissions were received. The Townsville City Waterfront PDA Development Scheme Public Notification Submissions Review Report summarises all submissions received during the public notification phase. All submissions were considered by the Townsville City Council in partnership with the Minister for Economic Development Queensland (MEDQ) and the Port of Townsville Limited and amendments were made where appropriate. Development assessment powers in Area A have been delegated by the Minister for Economic Development Queensland (MEDQ) to Townsville City Council. All Townsville City Waterfront PDA development applications in Area A should be lodged with Townsville City Council. For Area B (shown in blue), applications should be lodged with MEDQ. Schedule 5 of the Development Scheme maps the areas of responsibility. 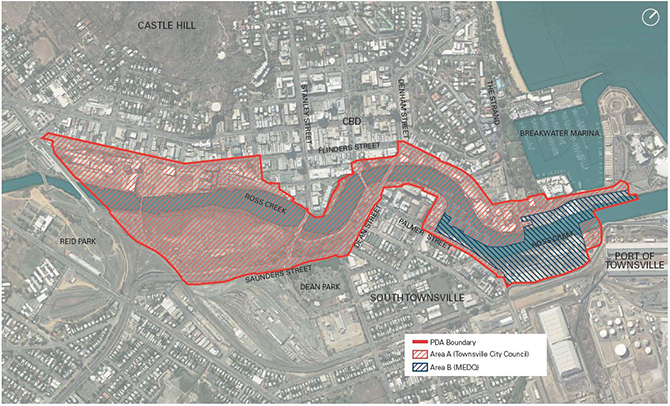 All development within the Townsville City Waterfront PDA boundary will now be assessed against the Townsville City Waterfront PDA Development Scheme. Prior to lodgement, applicants are encouraged to contact council to organise a pre-lodgement discussion on conceptual and detailed design proposals. While this is an informal process, pre-lodgement discussions allow developers and the development assessment team to work together under a streamlined assessment process. For a pre-lodgement meeting please contact council via the online pre-lodgement request form. Application fees are in accordance with the Planning Services Schedule Fees and Charges. Fees can be paid by cash, credit card (a non-refundable credit card surcharge fee of 0.5% applies for all payments by credit card (only Master Card or Visa accepted), or by invoice account. Network infrastructure identified for the PDA is listed under an Infrastructure Charging Offset Plan (ICOP). The ICOP identifies the level of service within and adjacent to the PDA at the 2026 planning horizon and consists of water supply, sewerage, footpaths and cycle ways. The ICOP also provides relevant details of any offsets that may be applicable against infrastructure charges. For enquiries about the Townsville City Waterfront PDA or Development Scheme, please contact council. The Marine Plant Management Guideline outlines the management of mangroves and other marine plants on a section of the Ross Creek in Townsville, i.e within the Priority Development Area. It has been developed in recognition of the important environmental values of Marine plant areas protected under State legislation and the need to actively manage the PDA.